It's been one very wet summer, this Sunday was no exception. The day started dry, with just a little overcast. After an hour it changed to a persistent drizzle. Luckily throughout the day there was never a down pour. One advantage, without the sun beating down on the steel hull, it was relatively comfortable below decks. I think I'm getting use to giving wet tours. I'm starting to learn how to keep visitors under shelter at each tour stop. For example, I can talk about the all the 01 level stops (the motor whale boat, 20mm, and 40 mm) under the signal bridge overhang. Then I give everyone a quick walk through. This minimizing the time that they're exposed to rain. We were a little short of guides, so we all kept pretty busy. I gave three tours, with an average of approximately ten visitors in each group. On the 2nd tour there were several visitors who's father/grandfather served in the Canadian Navy on Corvettes. 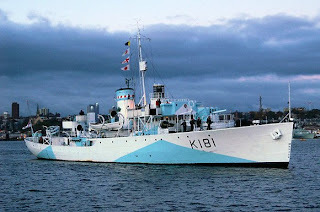 This gave me a chance to give a plug for the HMCS Sackville, a Canadian Corvette Museum Ship. The Corvettes were a stop gap measure. These ships were deployed a few years before Destroyer Escorts were available, during the dark days of 1941. Compared to Corvettes, the Destroyer Escorts were faster (21 knots vs. 16 knots); larger in size (306 ft vs. 205 ft,); had bigger crews (215 vs 85); had better radar and sonar; and were much more heavily armed. I would say that sailors who served on these small ships, during the dark days of the Battle of the Atlantic earned every Canadian dollar they were paid. There are some excellent photos of the HCMS Sackville on the Steel Navy Web Site, and on Macs Navy Links (including pictures of the Sackvilles hull during maintenance when the ship was out of water). Here's the link to the Official HCMS Sackville Website. During one break I started chatting with a few young ladies on the guest shop deck area. 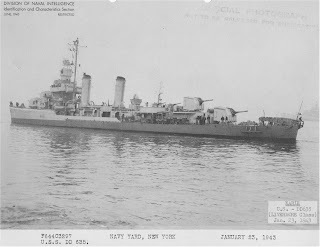 One visitor mentioned that her deceased husband had served on the USS Earle (DD-635/DMS-42). I promised that I would do a little research and post some links. Photos of the USS Earle are available on Navsource. One Earle Shipmate posted a few of his recollections. A sister ship of the USS Earle was the USS Thompson DMS-38. A major motion picture in the early 1950s was filmed on this ship - The Caine Mutiny.